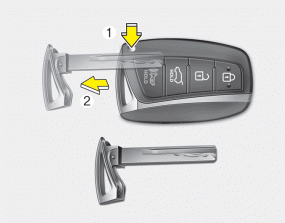 To remove the mechanical key, press and hold the release button(1) and remove the mechanical key (2). With a smart key, you can lock or unlock a door (and Tailgate) and start the engine. 2. Close all doors, engine hood and tailgate. 3. Press the button of the outside door handle. 4. The hazard warning lights will blink and the chime will sound once. 5. Make sure that doors are locked by pulling the outside door handle. - Any door except the tailgate is open. 1 Close all doors, engine hood and tailgate. 3. The hazard warning lights will blink and the chime will sound once. 4. Make sure that doors are locked by pulling the outside door handle. 2. 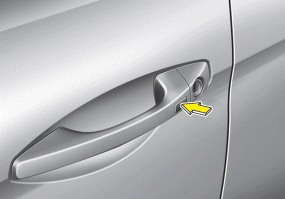 Press the button of the driver's outside door handle. 3. The driver’s door will unlock. The hazard warning lights will blink and the chime will sound two times. 4. Press the button twice within 4 seconds and all doors and the tailgate will unlock and the hazard warning lights will blink and the chime will sound two times. ❈ If you press the button of the front passenger’s outside door handle while carrying the smart key, all doors will unlock. 1. Press the unlock button(2) of the smart key. 2. The driver’s door will unlock. The hazard warning lights will blink and the chime will sound two times. 3. Press the unlock button(2) twice within 4 seconds and all doors and the tailgate will unlock. The hazard warning lights will blink and the chime will sound two times. After pressing the button, the doors will lock automatically unless any door is opened within 30 seconds. 2. Press the tailgate handle button. 3. When all doors are locked, the hazard warning lights will blink two times. 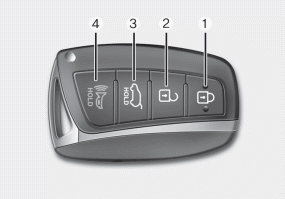 The button will only operate when the smart key is within 28~40in. (0.7~1m) from the tailgate handle. 1. Press the tailgate unlock button(3) for more than 1 second. 2. When all doors are locked, the hazard warning lights will blink two times. 1. Press the panic button(4) for more than 1 second. 2. The horn sounds and hazard warning light flash for about 30 seconds.